20th January 2009 - Well look at this, two movie reviews in a row. I have been watching lots of DVD’s this week but this is a film that stuck out, so I thought it would be a great film to review this week. ‘Seven Pounds’ stars Will Smith and he is brilliantly supported by Rosario Dawson, Woody Harrelson and the very under rated and under used Barry Pepper. 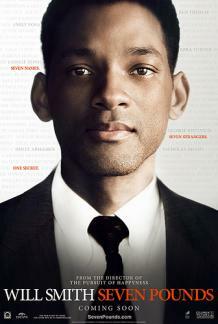 The film is directed by Gabriele Muccino who also directed Will Smith in the great 2006 film ‘Pursuit of Happyness’. Also for the film facts people out there Tom Cruise and Nicole Kidman’s adopted son Connor Cruise has a brief appearance as a younger Will Smith in the film. Looking at the cast leads me to believe this may be a Scientology film as of course Tom Cruise, as we all know is one, and with his son in the film makes me see the first clue. Then of course Will Smith has many ties with Scientology but has never publicly said he is a Scientologist only that he thinks the ‘ideas in Scientology are brilliant and revolutionary and non-religious’. The third and final clue for me is Barry Pepper who is also said to be a practitioner of the Scientology faith. Now what does this really have to do with the film? Well when you see links like that it can’t help but make me think about the film itself and the message its trying to put across to the audience. Does it make me think any lesser of the film? No way. But it does sit there in the back of my mind making me think about the bigger picture and the wider message of the film. I thought ‘Seven Pounds’ was a really good film but emotionally it lacked a lot as far as I’m concerned. Not because the performances weren’t great or the directing wasn't good but because this wasn’t a straight forward drama. This is a drama with a twist and the whole way through the movie your aware there is a twist but you just don’t fully know what it is. So for me, and the people who I watched it with, were so busy thinking about what was going on that we didn’t fully get hooked into the emotional story of the characters. So when things start to happen that are affecting the characters emotionally I just didn’t feel anything. Again this doesn’t take away from the performances themselves as they were great and deserving of the praise they have been receiving. The film just lacked the emotional impact of films like ‘Pursuit of Happyness’ and I think thats due to the attention of the audience focusing more on ‘what’s really happening’ rather then ‘what’s happening right now’ on the screen. So taking all that into account what do I rate this film? Well I really enjoyed it and the story was still pretty interesting, if not a little far fetched, but I still gladly give this film 7/10.